belong to Bo Hansén, and is free to use for private DIY purposes. It is not permittet to use this material for commercial business without permission. 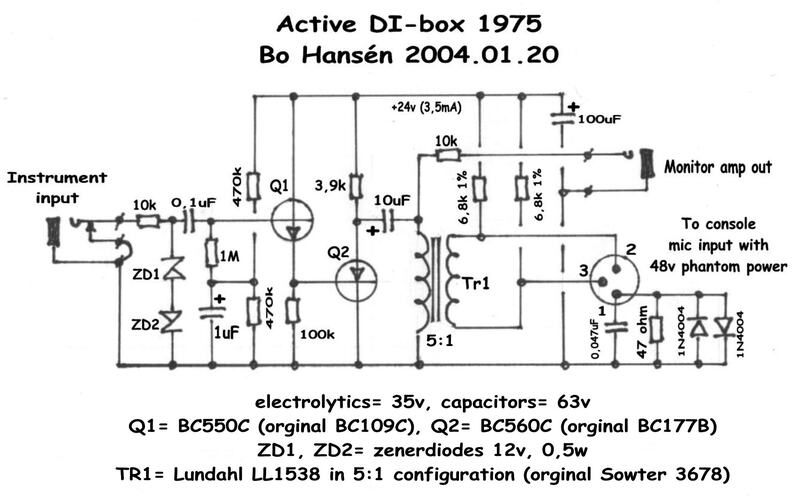 I designed this DI-box in the middle of 1970 when I worked as a recording engineer. During this period, there were mostly just home-built passive DI-boxes with small transformers like Beyer, KeMo or Sennheiser, around the studios here in Sweden. When I recorded electric bass guitar, I always missed the clear steady bottom, so I have to do something about it, and the result was the "DI-box 1975", whish I now present here as a DIY project. can be read here on Group DIY forum near 200.000 visitors have been there. This design is not "rocket science" it is a simple basic circuit that is easy to build and easy to get to work, but it is still of top quality that is hard to beat. The front-end transistor is not of a JFET/field effect type that is normally in a DI-box, this design uses instead a bipolar silicon transistor. The advantages are that they are easier to find on the market, and they are also more reliable. The disadvantage is the difficulty in obtaining high input impedance as 10 Mohm, but 1 Mohm is ok, and good enough for this application. An interesting note is that around 1 Mohm is probably one of the most common impedances on guitar and bass amps of all time, and is probably the reference impedance that the pickup manufactures use. 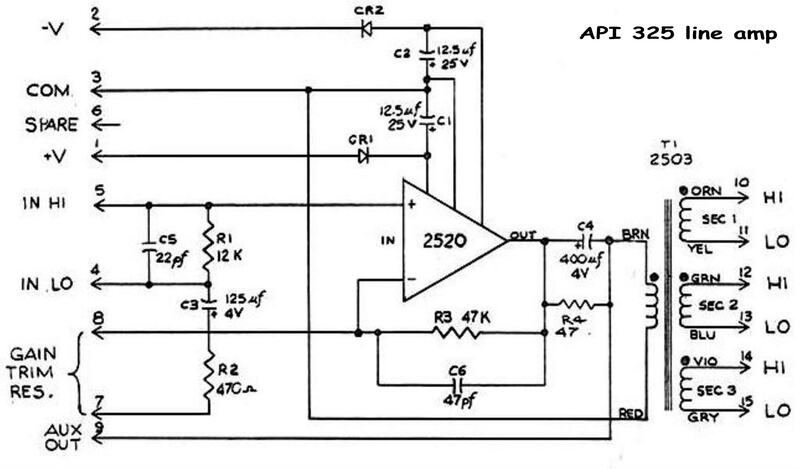 The circuit is a buffer amp consists of two emitter followers, the first one with low current to ensure high input impedance and low noise, and the second with higher current to deliver good drive capacity for the output transformer. The internal voltage supply is selected to 24 volt to get a compromise between good headroom and low current consumption. 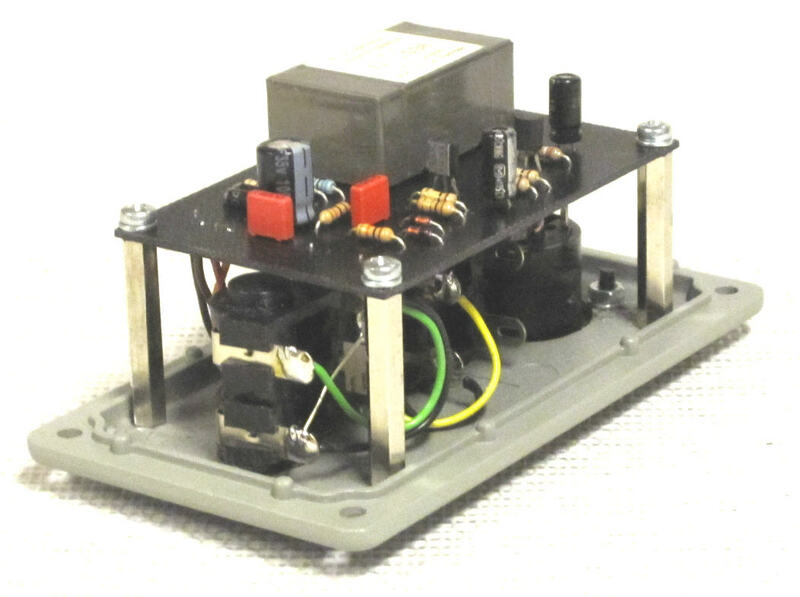 There is no groundlift switch that is normal, but instead uses a ground loop supressor built around two diodes, a resistor and capacitor, resulting in a safer operation for the DI-box electronics. There is also a protection circuit for the input, consisting of two zener diodes and a resistor. This offers a good protection against high signals such accidentally connected speaker signal. connector pin 1, and also connected to a solder tag fixed in one of the XLR fasten screws. Then a additional cable from XLR pin 1 to the electronic ground system rail (the bottom line in the schematic) in series with the 0,1 uF, 100 ohm and the two diodes. The two tele jacks must be isolated from the metal box, use plastic jacks, with plastic nut or crome nut with isolated washer, the jacks ground/sleve shall only be connected in the electronic ground system rail. This is very important, to get the ground loop suppressor to function properly. The input jack should be shorted to ground when it is un-plugged. There is an extra connection/solder tag for the rear tip contacts that is the brake switch, this connection/solder tag shall be connected to the ground on the input jack. This removes noise, hum and interference with un-plugged input jack. The metal casing of the transformer shall only be connected to the electronic ground system, and not in contact with metal box. it is not unususal that there is an extra cable or connector pin for the transformer core, this must also be connected to the electronic ground system. If the LED is mounted visible from the outside from the box, it must of course be connected with loose cables from pcb. The long leg shall be connected next to the two 6,8K resistors. If the LED is not used, use a link instead of LED. 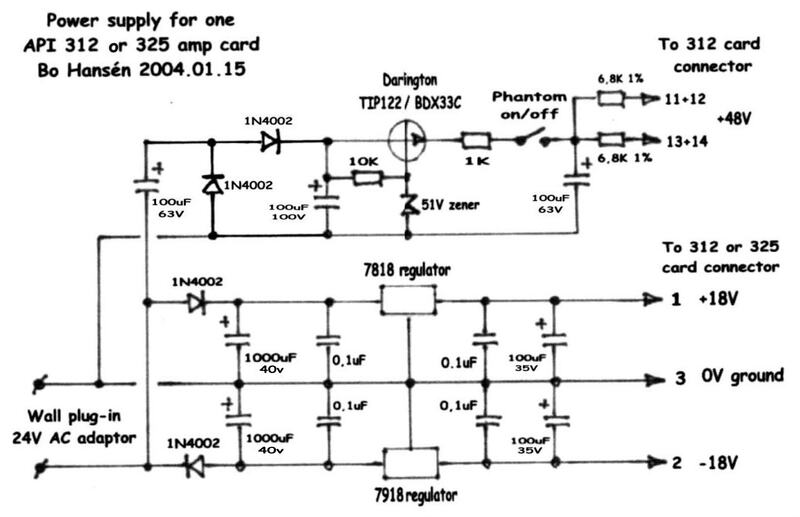 This design accepts almost all transistors that are of a general purpose small signal amplifier type. that the transistor is doing a good job in this DI-box circuit. Use only good brands and types such as Philips, SGS/Ates, Motorola, National, Fairchild. This package outline is called TO92 / TO226AA, case 29-04, style 17, according Motorola standard. There are also many other useful transistor types in the U.S. package outline style, with legs arranged from left to right E-B-C, and this package outline is called TO92 / TO226AA, case 29-04, style 1. 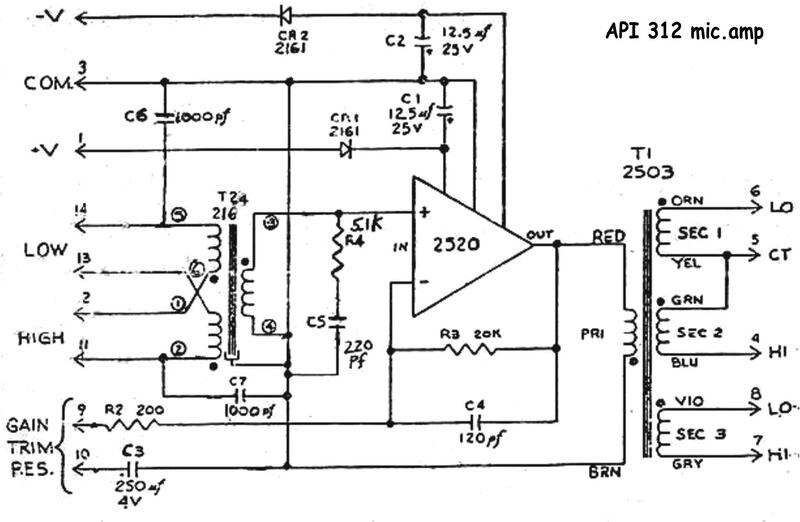 This version will fit on the pc-card if the transistor is rotated a half turn. To make it even more complicated, so there is an additional U.S. package outline wish is also used in Japanese transistor types. This version have the legs arranged from left to right E-C-B, and this package outline is called TO92 / TO226AA, case 29-04, style 14. If this version will fit on the pc-card you have to cross the C and B leg. Put on a piese of insulation sleeving on one crossed leg, in order to avoid short circuit between them. 0,1 uF capacitors of polyester or polypropylene type, minimum rated 50 volt, pitch between legs 5 mm. 10 uF and 100 uF aluminium electrolytic capacitors minimum rated 35 volt, pitch between legs 2-3,5 mm. pin 8 to ground rail. a good alternative to Lundahl. price cheaper than above, but still good quality. 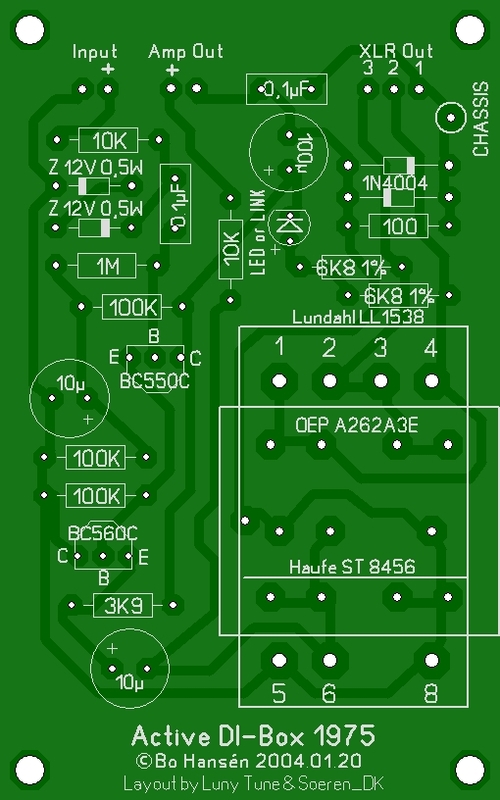 I have done some measurements on the Lundahl LL1538, Haufe ST8456 and Walters OEP A262A3E, in my DI-box circuit. 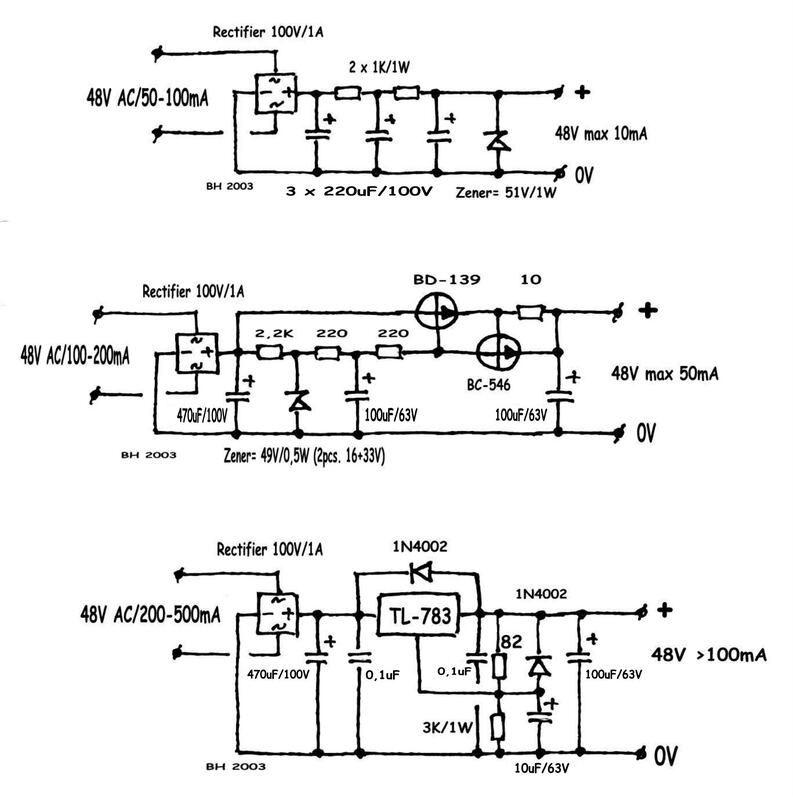 Here is a brief comparison of the three transformers that fits the circuit board layout. Lundahl LL1538XL have very near same specification as LL1538, but because it have approx. 45% bigger core, it can handle 3 dB more level. There are lots of other good mic transformers with ratios around 1:5 which can be used backwards in 5:1 configuration for this DI-box design. These do not fit directly on the pc-card so they may be connected with loose cables. The transformer housing must be isolated from the DI metal box if it is mounted outside the pc-card, but it must be connected to the pc-card electronic ground system. here are some good brands and types that can have a nice character and personality. The old famous Neve/MarinAir/St.Ives 10468/VT22670/T1454 mic input transformer, configurated in ratio 4,8k to 300 ohm can also fit very nice. Metal boxes of die cast aluminium is very practical and easy to use. An example is my prototype pictured here, where I have assembled everything in the lid. 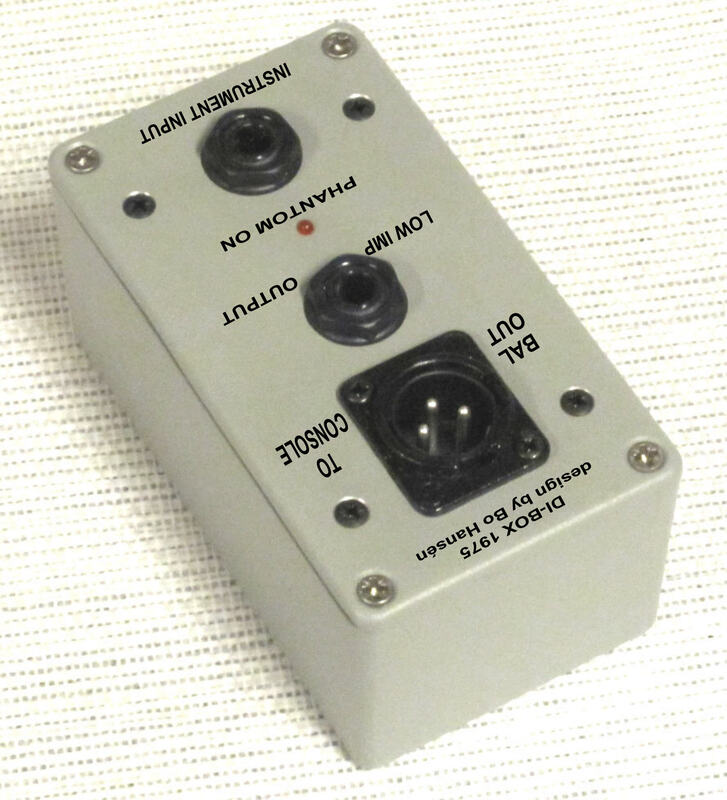 This box is manufactured by Deltron, type number 461-0040, LxWxH 114x65x55 mm, painted in light gray. LL1538XL and OEP A262A3E are too high. If you are not so mechanically handy, it is better with a larger box where the pc-card is mounted on the bottom and contacts around the sides. A suitable box for this is Hammond type number 1590-TBK, LxWxH 121x80x55 mm, painted in satin black. Install the pc-card with 4 pcs. 6 mm spacers with 3 mm hole (or three nuts), to get a distance between the pc-card and box. Both boxes are available from ELFA, Farnell, Mouser, Newark, RS-components. Of course, you can find nicer small metal instrument cases of various brands on the market, but these are usually much more expensive. The usual "hook up wire" type AWG22 for internal wiring will do just fine, which can be twisted in pair nicely. To get a first indication that the DI-box electronics are working properly, only two measurments needed to be done. Connect the DI-box XLR connector to a mixer or preamp mic input with true 48 volt phantom powering. If the LED is used and it light up, this is a first sign of health. Note, if the console/preamp phantom powering not have the right specifictions, will not following test measurments be accurate. Use a digital voltmeter in dc mode and connect the negative test cord to the input jack ground and the positive test cord to the junction av the two 6,8k resistors, or the long leg of the LED if this is used, or the link if the LED not used, and here you should measure +24 volts, +/- 1 volt, if everything works ok. The next measurment is to check symetrical clipping and headroom. Move the positive test cord to the junction of 3,9k resistor, 10uF capacitor positive end and emitter on BC560 transistor, and here you should measure around +12 volts, +/- 0,5 volt. Max input level before clipping: +19 dBu/7,5 volt. XLR output impedance: 200 ohm transformer balanced. Max output level from balanced XLR before clipping: +4 dBu/1,2 volt over 1 kohm load. Distortion: 0.05% 40 Hz - 20 kHz (0,01% 20 Hz) un-weighted, 100 mV out over 1 kohm load. Max current consumption: 3,5 mA at 48 volts phantom powering. New York, Long Island when he where on visit around 1975. This old pre's is still used in recording productions here in Sweden, and have same 2520 op-amps. The 2520 discrete op-amp in combination with API 2622 (or Jensen JT-110) mic input transformer and the API 2503 "quad fillar" output transformer, give the 312 mic preamp a unique sound with a own personality, ok some time it have a hard and a bit dirty character, in this time one of the better sounding pre´s on drums and electric bass. Also we modify one of the 312 amp cards, so we can use it as a DI-box with hi-Z input. and use it close to the base player with short guitar cable, and then from line output direct in to the control room via a Urei LA-3 leveling amp/compressor and then stright in to a Ampex MM-1100 24 channel machine. This modification I have done here, is a further development from 1970´s orginal version, and I have add -10 dB pad, input protection, switching for mic and DI mode, ground lift, variable monitor amp output, line and mic level output. This is a graet DI-box, try this on bass guitar, and you have a very nice bass sound. but with out the microphone input mode. 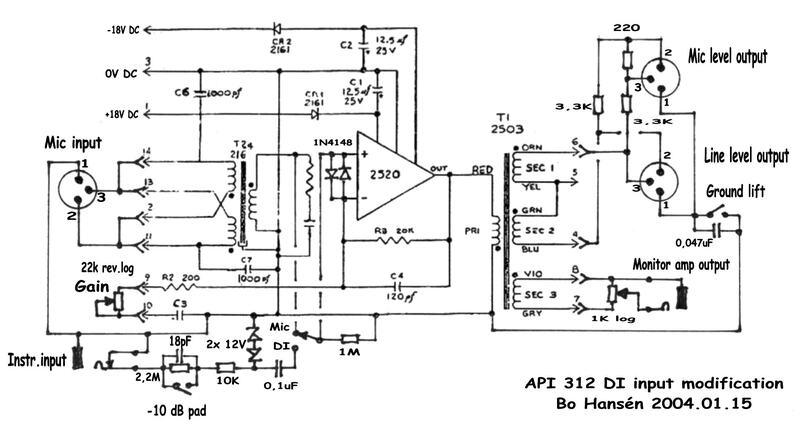 Here are a power supply usable for one 312 or 325 amp card. A very simple construction with a minimum of components. It was designed to get a a hi-z input on a pc-soundcard, to use as a measure input. Because the 10 k preset for the gate bias, you can use near all n-channel JFET transistor on the market. Adjust the preset for approx. the half of the battery voltage, measured between drain and ground. 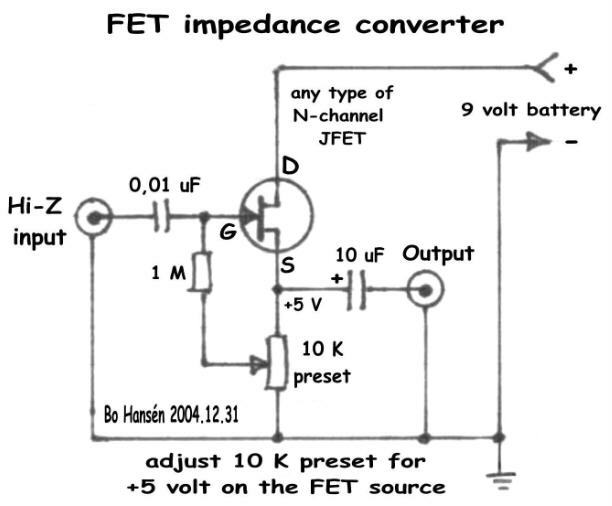 FET-transitor you want to use. Three well tested and short prof circuits. Easy to build, with a minimum of componets.